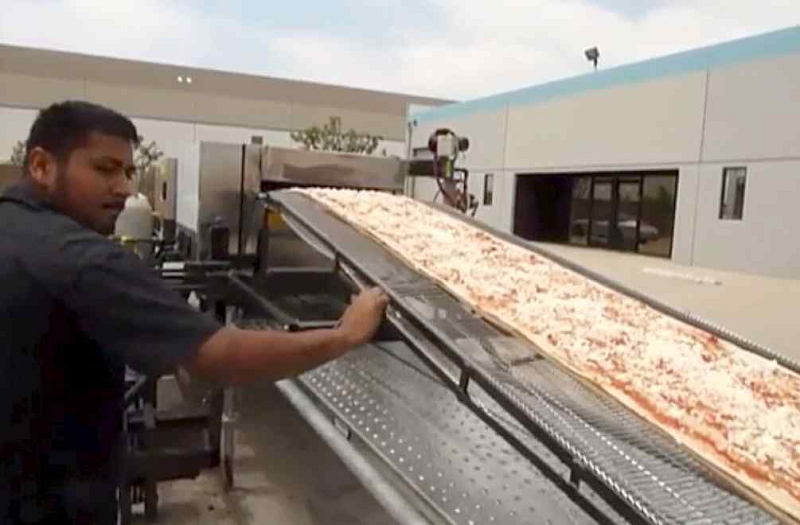 The pizza will be baked by a moving pizza oven traveling at about 17 feet per minute, and the process is expected to take about eight hours. The dough weighs about 8,000 pounds. The sauce will weigh about 5,600 pounds. The cheese will weigh about 3,600 pounds. Total weight of the pizza will be about 17,200 pounds at around 7,000’. The assemblers will be rotated every 90 minutes or so, so they can have breaks and move to other areas that they will be needed, etc. Toppings will be added to the last 1,000’ of the pizza for variety. In addition, a second world record — for world’s longest scaffold — will likely be broken. The event will also feature live music, food trucks and other food vendors. The pizza itself and proceeds from the event will go to local homeless shelters and food banks. Click here to read more. For more information, or to sign up to volunteer, click here. This entry was posted in Cities, Fontana, Italian and tagged fundraisers by John Plessel. Bookmark the permalink.